It was high time to do some spring cleaning, so I’m just now posting photos from last week’s story time, which featured the tale, Mabela the Clever (retold by Margaret Read MacDonald and illustrated by Tim Coffey). In the early times, some were clever and some were foolish. The Cat was one of the clever ones. The mice were mostly foolish. But the tiny mouse named Mabela was different. She had been taught cleverness. Mabela’s father teaches her that when she is out and about, she should 1) keep her ears open and listen; 2) keep her eyes open and look around her; 3) pay attention to what she is saying; and 4) if she has to move, move FAST! The Cat comes to the mice village and announces that the cats have voted to allow the mice to join their secret society. They are to show up at the Cat’s house on Monday morning to be learn the secret cat lore and be initiated. When we are marching, we never look back. The Cat is at the end, Fo Feng! FO FENG!! The mice line up with the smallest (Mabela) at the head of the line, and march singing into the forest. Suddenly, Mabela notices that the singing doesn’t seem quite as loud as at first, and she remembers her father’s instruction to keep her ears open and listen. Hmm…definitely softer! And then Mabela remembers her father’s second instruction to keep her eyes open and look around. She sneaks a glance back out of the corner of her eye and notices that the line is much shorter. Who is watching the Cat? Suffice it to say that Mabela remembers her father’s last piece of advice in time. She dodges the Cat, who gets tangled up in a bramble, and all of the mice escape from his backpack. If a person is clever, it is because someone has taught them their cleverness. After the story, we played the fo-feng game. The kids sang and marched while marched at the end wearing the Cat mask and fo-fenged the last person in line until I made it to the head of the line. Then the kids made their own Cat masks and mice paperdolls so they could re-enact the puppet play for themselves. Paolo Freire, author of Education as the Practice of Freedom and Pedagogy of the Oppressed, would be pleased. He drives through Argentina giving away books. To get everyone in the mood for St. Paddy’s Day, I decided to tell the story I call “The Helpful Fairies,” which I learned from Margaret Read MacDonald (who calls it “The Little Old Woman Who Hated Housework”). It’s a rollicking tale about an old woman who made the mistake of inviting a bevy of too-helpful fairies into her house, with disastrous results. And I just discovered that there is now a picture book of this story: Too Many Fairies: A Celtic Tale, by Margaret Read MacDonald (illustrated by Susan Mitchell). My puppet show was a dramatization of King Puck, by Michael Garland. In this tale, the fairies are helpful in a good way. Taking pity on lonely old Seamus and his goat Finny (who dreams of gaining wisdom like the fabled Finn MacCool), the fairies enchant the goat with the gift of gab. Inspired by Ireland’s oldest fair and the town where it takes place, the book also celebrates books and reading—and librarians! For our music and movement activities, we played “Follow My Leader” and “Mill and Grab” (when the leader calls out a number, players have to get into groups of that number). The older kids loved this challenge, but the younger ones just joined onto the nearest group, so there was lots of milling as the older kids then subtracted themselves and tried to reform so as to keep the numbers correct. The King Puck mask project was a hit with everyone! During the birthday week of Dr. Seuss, I taught my colleague’s two preschool story times because she was on vacation. It was hard to face the dismay on the children’s faces as it dawned on them that their beloved Mrs. Jones was absent. But a lot of aerobic music and movement activities soon won them over! Because some of the kids come to my family story time, I didn’t want to repeat my Green Eggs and Ham puppet show, so I gave them a flannelboard telling of One Fish, Two Fish, Red Fish, Blue Fish. They had fun chanting along. Then we practiced counting backwards. It was a bit hard to count backwards from twelve, but everyone knew how to count down from ten. When we got to “Blast Off!” I zoomed my Cat in the Hat hat into the air like a rocket. We also had a lot of fun with Hooray for Fish, by Lucy Cousins. Red, blue, and yellow fish. The kids were soon filling in the fish descriptions for me. There were LOTS of fish to count in Hooray for Fish, and the kids proudly counted them all. The kids picked out gauzy scarves and pretended to be fish swimming in the sea to the music of Saint-Saëns’ “Aquarium” from Le carnaval des animaux. It was an amazing week of immersion in the wacky world of Dr. Seuss, starting on March 2, his actual birthday, when I was invited to a local ECEAP preschool to present a Seuss story time. Green Eggs and Ham has always been one of my favorite Seuss books, although the book and I got off to a shaky beginning. It was a gift from a dear friend of our family, and I read it immediately after stuffing myself shamelessly at our Christmas dinner. Suddenly I wished I hadn’t eaten quite so much. He doesn’t like green eggs and ham. He doesn’t like them! By next year I need to laminate the stick puppets I created for the puppet show, so they will last through many more years of Dr. Seuss birthdays. I also need to sew cloth bodies instead of paper bags for Sam-I-am and his big friend. The kids really wanted to play with my puppets, but my quickly-produced hand puppets and stick puppets were too fragile. And who could blame them? These characters and the story are irresistable! Fortunately, the kids in my family story time got to make their own finger puppets and play with them in the puppet theater! Last Sunday evening Stuart and I drove down to the Seattle Center for a special showing of Leonardo Live sponsored by the Seattle International Film Festival. Seeing these masterworks on a big screen was a revelation. Aside from noticing details that I had never seen in reproductions, it was amazing to see the actual sizes of these works. Their impact was visceral. I was struck by the 3-D quality of the paintings and the impression of living movement captured in an instant. Theatre and religion…function from expectation–it’s a sort of a silence that you get, not in death, but in the moment somebody arrives in a door. Several of Leonardo’s portraits give one the sense of glimpsing the subject at a doorway or in a moment’s glance across a crowded room. Instead of showing a static surface, Leonardo somehow creates an illusion that lets us feel something of the personality and the physical presence as well as the hidden depths of these very real people. Last Sunday, the Sno-Isle Libraries sponsored my puppet show, “Lessons from the Geese,” in partnership with the 2012 Port Susan Snow Goose and Birding Festival. The program was also supported by the Stanwood/Camano Friends of the Library and by my husband, Stuart, who created our beautiful Snow Goose puppet and performed the role of Canada Goose in the play. It was wonderful to be a part of this community festival honoring the annual influx of wintering birds in the fields and wetlands bordering Puget Sound. We’re still marveling at our good fortune to be living in the midst of such beauty. Port Susan has been identified as a priority conservation area of high biodiversity importance within the greater Pacific Northwest by The Nature Conservancy. The festival takes place in multiple venues in Stanwood, Camano Island, and environs. Our performance took place at the Four Springs House, part of a 50-acre nature preserve on Camano Island. My play was inspired by The Wonderful Adventures of Nils, by Selma Lagerlöf, the story of a naughty and inconsiderate boy who gets shrunken to the size of an elf and flies around Sweden with a flock of wild geese. Lagerlöf was commissioned in 1902 by the National Teachers Association of Sweden to write a geography reader for the public schools, and the story is a vehicle for teaching Swedish natural history, folk tales, history and traditions, in addition to geography. In 1909, Selma Lagerlöf became the first female writer to win the Nobel Prize for literature. After the puppet show, I taught kids and their parents how to fold an origami flapping bird. We colored the wingtips black so it would look more like a snow goose. 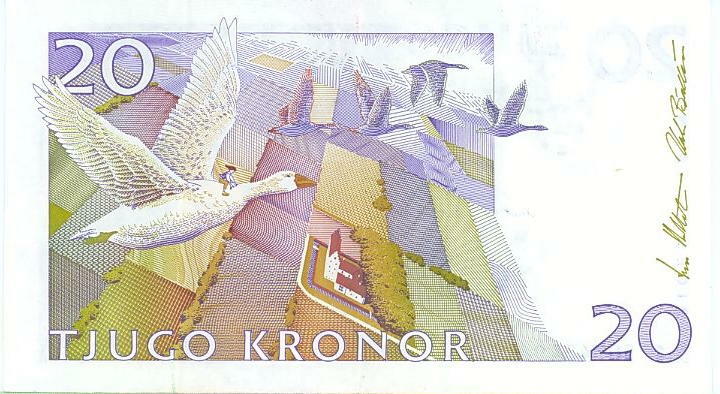 Nils and the geese appear on the Swedish 20 kronor bill honoring Selma Lagerlöf.